← 230 "Treehouse of Horror X"
The living room is a night club Bart, Lisa, Marge and Maggie are let in by the bouncers, however, Homer is not. "I did not win the Nobel Fart Prize"
E-I-E-I-(Annoyed Grunt), also known as E-I-E-I-D'oh, is the fifth episode of Season 11. It aired on November 7, 1999. "Homer begins challenging everyone around him to duels after he sees a Zorro film at the Googolplex theatre. Most people back down, until Homer meets an old-fashioned Colonel who takes him up on his dare. Unable to get out of the contest with the Colonel, Homer and his family flee to the country, where they become farmers. Farm life is difficult until Homer creates a new crop called tomacco—tomatoes crossed with tobacco." The Simpsons go to a movie theater to see The Poke of Zorro. Afterwards Homer, imitating Zorro, frightens Snake Jailbird away by challenging him to a duel, slapping him with a glove. He starts to use his dueling glove to get anything he wants from people: First up is Moe, for calling him "heavyset", but after a slap, he gives Homer a free beer. Thus begins a montage to the tune of "Glove Slap" a parody of The B-52s song "Love Shack". When a gun-toting, Southern colonel actually accepts Homer's challenge, Homer finds himself bound to a duel at dawn the following day. The colonel and his wife set up camp outside the house in his RV, awaiting the duel. With Homer fearing for his life, the family sneak out and search for a temporary home. Along the way they spy Jimmy Carter's Habitat for Humanity: Homer calls Carter a lazy bum, who responds by pulling off his glove to slap him, as Homer has been doing. They find Grampa's old farmhouse on Rural Route 9 outside of Springfield, where they decide to live and, despite the land's poor reputation for growing crops, Homer becomes a farmer. Homer calls Lenny and requests that he send plutonium to make the crops grow "real big, real fast". 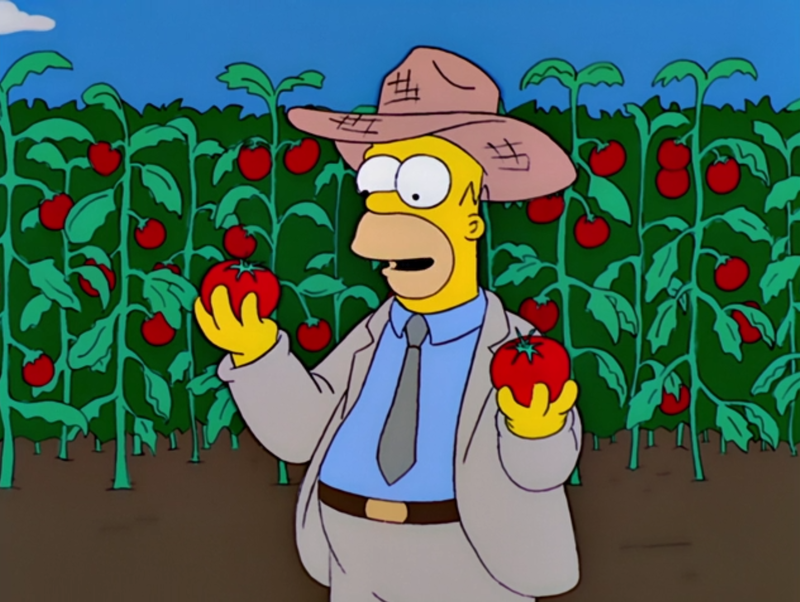 They do eventually grow, but since Homer scattered seeds indiscriminately, his main crop is Tomacco, a mix of tomato and tobacco, which tastes bitter but is very addictive. It is such a success that executives from Laramie Cigarettes offer to buy the rights to Tomacco for $150 million. Homer rejects the offer as insulting, demanding $150 billion for tomacco, which they refuse to pay. Dumped back at the farmhouse, the family see tomacco-addicted animals from other farms eating their crops. Homer saves the last plant, but when the rest of the animals attack the house, he tosses it into the air and it lands right into the hands of a Laramie executive. The Laramie executives' helicopter leaves, but a tomacco-addicted sheep has snuck on-board. It creates mayhem, causing the helicopter to fly out of control and crash, destroying the final tomacco plant and killing the executives (though the sheep is shown to survive). With all the tomacco crops gone, the Simpsons return to Springfield, forgetting that the Colonel is still there. The Colonel shoots Homer in the arm, but Homer says he'll only go to the hospital after he tries some of Marge's mincemeat pie. The episode was written by Ian Maxtone-Graham and directed by Bob Anderson. The B-52s guest star as themselves. Modified on July 7, 2016, at 12:31.